The Versa-sharing deal will give Chrysler a car later this year to sell in South America. NASHVILLE -- Chrysler LLC and Nissan Motor Co. have postponed plans to share a North American-built small car and a full-sized pickup until they can reduce costs. A third vehicle-sharing project, in which Chrysler will sell a version of Nissans compact Versa sedan, will continue on schedule, the companies said late Thursday. The automakers blamed the interruption on a worsening economic picture, including dollar-yen exchange rates, that is throwing sales forecasts in doubt. Because of current economic conditions, Nissan and Chrysler teams working on the two other projects have been asked to ensure that financial objectives for both companies can be met before these two projects move forward, said a statement distributed by Nissan North America Inc. The plans now on hold include the next-generation Nissan Titan, which was to be derived from the Dodge Ram pickup, made in Saltillo, Mexico. 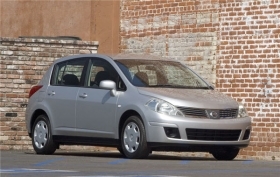 The other paused project was to be a fuel-efficient Nissan small car that used a Chrysler design. Nissan and Chrysler made the arrangements early last year when Chrysler was seeking a global technology partner after the demise of its merger with Germanys Daimler AG. At the same time, Nissan needed a leg-up in the full-sized pickup segment, where its U.S.-built Titan was proving a development resource drain. Now a year later, both automakers situations have worsened. Chrysler faces a Tuesday deadline to submit a viability plan to the U.S. Treasury in order to preserve $4 billion in federal bailout loans. This week, Nissan CEO Carlos Ghosn said the automaker may post a $2.9 billion loss for the current fiscal year year, and is cutting 20,000 Nissan jobs around the world. Chryslers dire outlook has drawn a new player into the equation: Italys Fiat S.p.A.
A source familiar with the Chrysler-Nissan alliance said the interruption of its plans with Nissan has nothing to do with Chryslers global partnership talks with Fiat. But that deal would supply Chrysler with a lineup of new models based on Fiats European vehicle architecture. Japans automakers have been stunned by the appreciation of the yen against the dollar in recent months. Higher yen values raise the manufacturing cost of critical Japanese-made components, such as small-car engines and electronics. Both Nissan and its chief Japanese rival Toyota Motor Corp. have reacted to forecasted losses by ordering stern reductions in operating costs around the world, and by making cuts in capital investment plans.